The Winning Poker Network has just issued a round of refunds to customers to compensate them for “unfair gameplay practices carried out by a player.” The credits have already been applied to affected users' account balances. The email was somewhat vague as to the specific offenses committed by the individual(s) in question, the times and dates of the gameplay sessions involved, and the techniques employed to catch the cheater. This is standard practice at internet poker sites, which don't want to go into too much detail about their security procedures for fear of making it easier for rule-breakers to get away with their misdeeds in the future. Most of those who said they received similar emails were micro- and small-stakes PLO players, but at least one user stated that he played exclusively NL Hold'em. 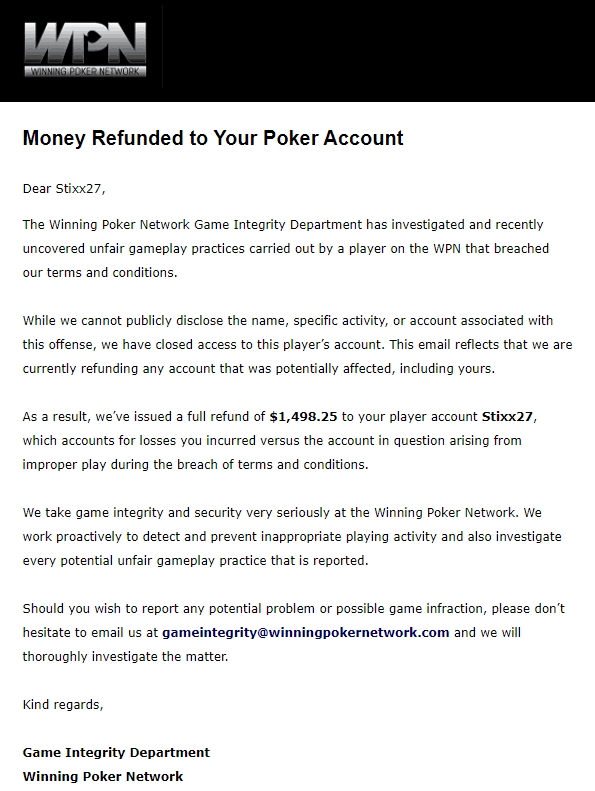 The violations leading to the refunds appear to have occurred in cash games rather than tournaments or SNGs. UPDATE March 12, 2018 - It appears that this initial round of refunds has concluded. Reports from players who received refunds indicate that the majority of them were, in fact, PLO cash game players as we had initially thought. While the online poker community was happy to see appropriate action taken against people violating the terms of service, there are still lingering questions about the transparency of the process and whether or not there are additional bot/colluder accounts that were not caught by the WPN's security review. Our Security & Fraud Department is constantly monitoring game play and there are cases where refunds are triggered, there are cases where they are not. We also take player reports very seriously and again some might not involve a refund. If you have not received an email from our team then your account has not been affected by breach of Terms and Conditions. This is a pretty vague answer, and it doesn't really do anything to alleviate any concerns customers might have about refunds that may be due to them that haven't been paid out. While the WPN's initial steps toward combating cheating are to be commended, we'd like to see them communicate their new policy more effectively and take user feedback into account. UPDATE March 28, 2018 -The Winning Poker Network has just completed another wave of refunds as reported by players on both Reddit and Twoplustwo. This time, the sums involved seem to be smaller, generally in the range of $1 to $15. This indicates that the network is now refunding micro-stakes players. The WPN is thus demonstrating its commitment to customers of all stakes even those who sit in the penny games. There are many online poker sites that habitually refund their players when collusion, botting, or other forms of cheating are discovered, but the WPN has not historically been at the forefront in this area. Over the years, this has led to accusations that the network security department was not treating cheating seriously. In recent months, criticism of the network has escalated. One of the harshest critics of the WPN's security protocols has been Joe “Chicago Joey” Ingram. He posted a video on his YouTube channel on Feb. 3, 2018, documenting various cheating activities that he claimed were prevalent at the network. The twoplustwo thread discussing Ingram's allegations has close to 1,000 posts: evidence that many readers found his accusations credible. Even Two Plus Two Interactive, manager of the most popular poker forums on the internet, has put pressure on the Winning Poker Network to enhance its game integrity efforts. On Feb. 24, the company sent an email to WPN CEO Phil Nagy inquiring about possible collusion, super-using, and other issues. Having failed to receive a response by March 1, Two Plus Two decided to remove all advertising from the WPN. The sponsored support forum for the Winning Poker Network was also closed. The WPN taking proactive steps toward cleaning up its games is exactly what players have wanted for some time. Assuming this round of refunds is reflective of a new philosophy at the network, we expect the prevalence of botting and collusion at the tables to abate. Poker botters post on their own forums about how easy or difficult it is to run bots at various sites, and so if the Winning Network becomes an inhospitable place for conducting these activities, the word will spread rapidly. Once this happens, potential customers who had been worried about playing in unfair games will be able to create accounts and open the WPN tables without fear. Who knows? Traffic may even surge to the point where the Million Dollar Sunday stops overlaying every week. If you've been holding off on registering at a WPN site, then maybe the network's beefed up game security protocols are just what you've been waiting to see. You can sign up for Americas Cardroom and obtain a 100% up to $1,000 bonus that clears at a 20% rakeback rate. You'll also receive a free $50 credit to your real money balance when you make your first deposit. Read our Americas Cardroom review for all the details. Other leading Winning Poker Network partner rooms include BlackChip Poker, True Poker, PokerHost, and Ya Poker (non-US).